If you use and iPad and haven’t signed up yet for SmartAppsForKids, you might want to check here: http://www.smartappsforkids.com/Every day is has a list of “Featured Free and Reduced Apps of the Day” where you can see a list of apps that the developers are offering for Free – on that day only. This site tends to be focused on Pre-K and Elementary level apps, yet does have a very extensive listing with numerous categories to help narrow your search. Kleinspiration is a great Blog created by elementary teacher Erin Klein. One of her pages is ”Tiny Tech Tips” where she has simple yet effective suggestions for using technology with your students. Erin speaks from an informed, enthusiastic, and fun perspective in bringing 21st Century technologies into the elementary classroom. Looking for K-5 iPad apps ? I keep finding great resources out on the web where educators are lists iPad apps for a variety of subjects or purposes. “K-5 iPad Apps According to Bloom’s Taxonomy” is a blog post on Edutopia. Diane Darrow not only lists some great apps, but also reviews them from the classroom perspective. She also provides a set of question to ask yourself when looking for apps in each of the 6 stages of Bloom’s taxonomy. I just discovered a GOOGLE DOC that tabulates educational apps, their functionality AND their numerous applications in the classroom. 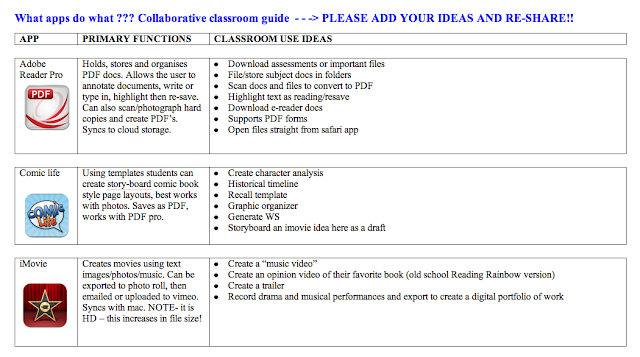 This document has the SHARE settings to allow all who have the link the ability to edit it – so other teachers can add their ideas – so everyone has access to the BEST edu-list of current apps and classroom tips for integration. Great idea! Take a look at the list – and add your favorite apps that you use in the classroom with examples of teaching strategies . . . and to share it with your colleagues! Finding good educational apps can be challenging. Browsing through the iTunes store is mind boggling, and not very productive. I discovered a site that is created by two teachers – Jayne Clare, a Special Education teacher, and Anne Rachel, an artist and Early Childhood educator. Their site has detailed and meaningful reviews and can be searched by grade level and subject. This is one of the better sites I’ve seen for finding apps that are worth downloading.